Smartphones have been around for a long time, and while every single app we use on our smartphones is made for the ‘touch’ experience, for some reason web browsers just don’t feel like they were designed for mobile. Mostly, they feel like a compressed desktop browser. 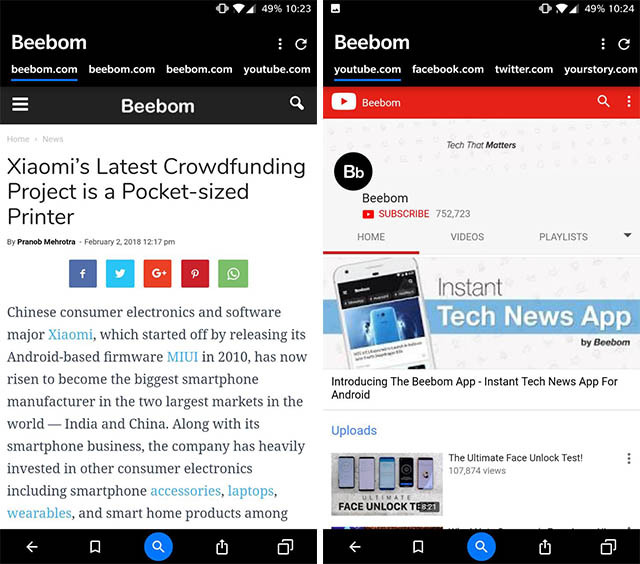 Since I’ve been using mobile browsers like Chrome for Android, Firefox, and others for almost as long as I can remember, I never really thought about just how the experience could’ve been made more suited for mobile. That’s what Cake Browser (iOS, Android) attempts to do, and when I tried it out, it felt really compelling. Cake browser takes a new approach to mobile browsers, especially when it comes to searches. Almost everything we do on our smartphones these days is done by an app. Facebook, Twitter, Instagram, online shopping — everything has an app. The browser is mostly there for searching the internet. Cake Browser takes a huge, touch-focused swipe at the way we search the vast trove of information (and misinformation) that is the internet. Instead of displaying Google (or Bing, if you so choose) search results, Cake works on the philosophy that more often than not, the first Google result is what most people care about. So, when you search for something on Cake, it automatically opens the top result and loads the next few results in the background. For the most part, the first result works perfectly. However, in situations where that was not what you were looking for, you don’t have to go to the search results (although you can). Instead, you can simply swipe left (Tinder, anyone?) to move to the next result. Searching for Beebom on Cake Browser automatically loaded up the Beebom website for me. Swipe left, and it’s on to our Hiring Page. Another left swipe took me straight to our YouTube channel, followed by our Facebook page, and our Twitter. In the time that I’ve been using this new browser, it has felt really compelling, and almost makes me want to make it my default mobile browser. I’m sticking with Chrome, for now, because change is difficult. I really think that Cake hits very close to a great mobile-first browser. A browser that mobiles deserve, but not the one they need right now.